In Seamer, famous for its annual horse fair, the locals turned out in force to show that it was not a case of four legs good, two wheels bad. As the peloton thundered through the village at speeds of up to 40kmph there were loud cheers of support. 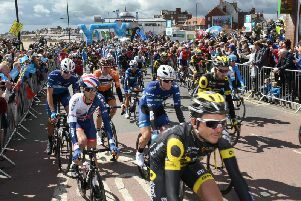 Youngsters strained to get a glimpse of Tour de France hero Sir Bradley Wiggins, riding for his newly formed Team Wiggins. The Jennison family, Oscar, 5, Sophie, 4, and dad Luke were out with handmade signs supporting Wiggins and Matt Prior. Mr Jennison said: “They have loved it. Dennis Gormley had come down from Filey with his Union Jack. “It’s just great for everyone,” he said. Local firm Schneider Electronics held a barbecue for its staff and had a party as the group went through the village.